Happy New Years everyone! 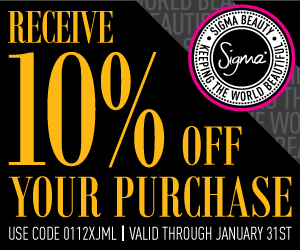 It's a new year, a new month and that means a new Sigma Beauty Coupon code! Enjoy 10% off your order with new coupon code 0112XJML valid thru January 31st! You will also get a free gift if you spend $30 or more! So remember, coupon code 0112XJML for 10% off your order!